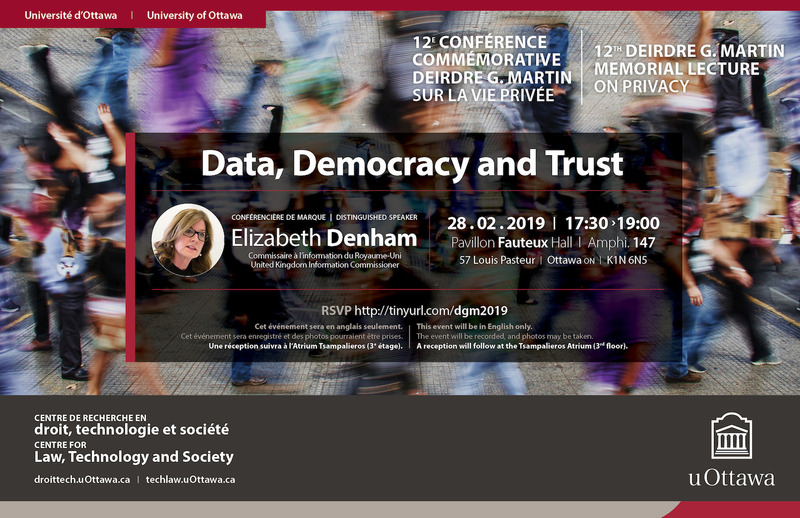 Elizabeth Denham was appointed Information Commissioner of the United Kingdom in July 2016, having previously held the position of Information and Privacy Commissioner for British Columbia, Canada and Assistant Privacy Commissioner of Canada. She has set out a commitment to increase consumer trust people have in what happens to their personal data. This forms the basis of her strategic plan, and has been demonstrated in her commitment to ensuring companies are transparent with the public about how personal information is used, notably with high-profile investigations into Yahoo, Camelot, WhatsApp and Facebook. The Commissioner has also demonstrated a focus on the essential role data protection can play in innovation, and the importance of organisations understanding the growing impetus on companies to be accountable for what they do with personal data. This forms a central part of the new General Data Protection Regulation, which comes into force in May 2018. Ms Denham oversaw the issuing of the ICO’s largest fine, a penalty of £400,000 to TalkTalk after the telecoms company failed to properly protect customer data from a cyber attack. She’s also overseen the conclusion of the ICO’s investigation into charities’ fundraising activities and a series of fines for companies behind nuisance marketing. Ms Denham is a strong voice for public access rights. A proponent of open government and open data, Ms Denham has called for the proactive disclosure of records and published best practices for government ministries and public bodies. While at the ICO, she has called for the Freedom of Information Act to be extended to private bodies doing work on behalf of the public, and proposed a review of legislation around the duty to document information. In 2011, Ms Denham was honoured as a UBC distinguished alumni for her pioneering work in archives and leadership in the field of access and privacy. In 2013, she received the Queen Elizabeth II Diamond Jubilee Medal for her service as an Officer of the Legislature of British Columbia, Canada. In 2017, she was recognised as being one of the three most influential people in data-driven business in the annual DataIQ 100 list. She was honoured to accept the appointment of Visiting Professor in University College London’s department of Information Studies. The professorship will extend until 2022. In March 2018, she was named as the most influential person in data-driven business in the updated DataIQ 100 list. In July 2018 the Information Commissioner published a report entitled Democracy Disrupted? Personal information and political influence, which sets out the findings and recommendations arising out of the ICO’s 14-month investigation into the use of data analytics in political campaigns. A separate progress report gives details of some of the organisations and individuals under investigation, as well as enforcement actions so far. In October 2018, Elizabeth was appointed chair of the International Conference of Data Protection and Privacy Commissioners (ICDPPC). The ICDPPC is the leading global forum of data protection and privacy authorities, encompassing more than 120 members across all continents. Une réception suivra à l’Atrium Tsampalieros (3e étage). Ce programme est admissible à 1.5 heures de formation professionnelle continue (heures de droit) pour le Barreau de l’Ontario (via la Faculté de droit, Section de common law). Cet événement est gratuit. Néanmoins, l'inscription est obligatoire. Néanmoins, les participants peuvent donner en ligne ce qu'ils pensent être juste pour le Centre. Cet événement sera en anglais seulement. Cet événement sera enregistré et des photos pourraient être prises.